Tintinnopsis acuminata from the Bering Sea, Station A12 of the Shippo cruise in 2012. 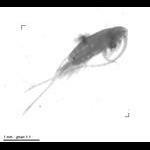 Tintinnopsis acuminata from a sample taken in Feb 2013 from Station FS2 in the Ganges River estuary. Z-stack image using a 60x objective & DIC optics. Tintinnopsis beroidea (probably). Z-stack of images made using a 40x objective and DIC optics, lugol's-fixed specimen from the Bay of Villefranche in October 2013. Tintinnopsis beroidea from the Bering Sea. Sample from Station A12 of the 2012 Shippo Cruise. Tintinnopsis beroidea. Specimens from the Ganges River estuary. Tintinnopsis brandti from Point B on Nov. 6 2018. A description of Tintinnopsis campanula by Ernst Haeckel in 1873 was illustrated with this drawing..
Tintinnopsis cylindrica. From the Ganges River estuary in Feb 2013. Tintinnopsis cylindrica From the Ganges River Estuary in Jan 2013 (st Ganga). The specimen has a lorica oral diameter of 29 microns. Tintinnopsis karajacensis (Brandt 1906). Specimen from the Ganges River estuary. Probably a Tintinnopsis kofoidi forming a new lorica. Tintinnopsis kofoidi from PtB on Oct 12 2015. Tintinnopsis lata (Meunier 1910) From the Chuckchi Sea in 2014. Tintinnopsis minuta specimens from the Ganges River estuary. The specimens were very lightly agglomerated. Tintinnopsis nana (Lohmann 1908). Specimens from the Ganges River estuary. Note that only the shape of the end of the lorica (pointed or rounded) seperates T. nana from T. minuta. Tintinnopsis parvula. Specimens from the Ganges River estuary. Tintinnopsis radix from Pt B in the Bay of Villefranche. Specimen collected July 8 2013 and fixed with Lugol's; Z-stack of images made using a 20x objective and DIC optics. Tintinnopsis rapa from the Bering Sea in 2012, Station A12 of the Shippo Cruise. From the Canadian Archipelago in August 2016. Originally described from the Greenland coast of Baffin Bay by Brandt. Tintinnopsis sinuata (Brandt 1896) From the Chukchi Sea in Setember 2017. Tintinnopsis subacuta - maybe (lorica not fully formed). Tintinnopsis tentaculata specimens from the Ganges River estuary. Tintinnopsis turbo specimens from the Ganges River estuary. Tintinnopsis urnula From the Ganges River Estuary. Station Ganga Jan 2013. Tintinnopsis vasculum (Meunier 1919) from the Chukchi Sea in 2016. Inset shows drawing from Meunier 1919.